Wow dude! The beaver pitcures look similar, yet different at the same time! Oh my goodness that was good. I also co-wrote the review of "City of Ember" under "Film". Also, thanks again Star for your nice comments above . 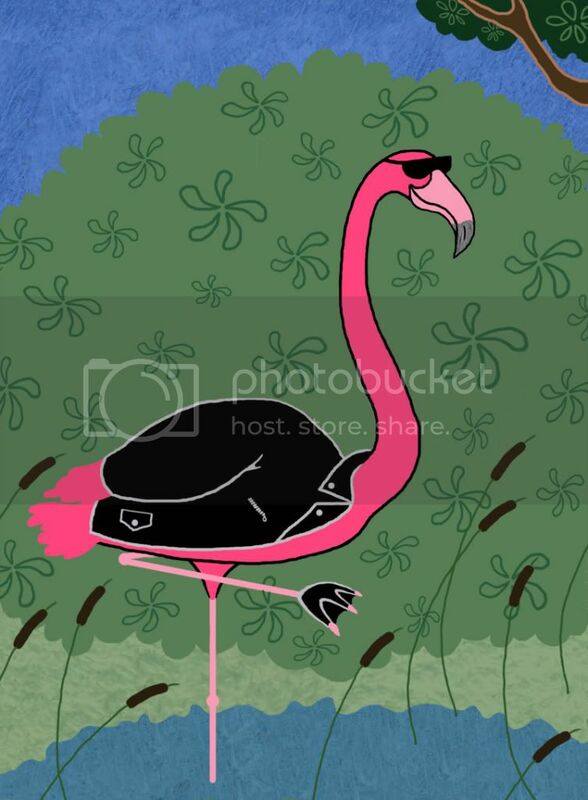 This picture was inspired by seeing someone wearing black pants and a pink blouse. I thought it was a great color combination. I’m planning to add a flamingo in a leather jacket to this picture, but at the moment I don’t have access to my scanner. I love your new stuff, animagusurreal! 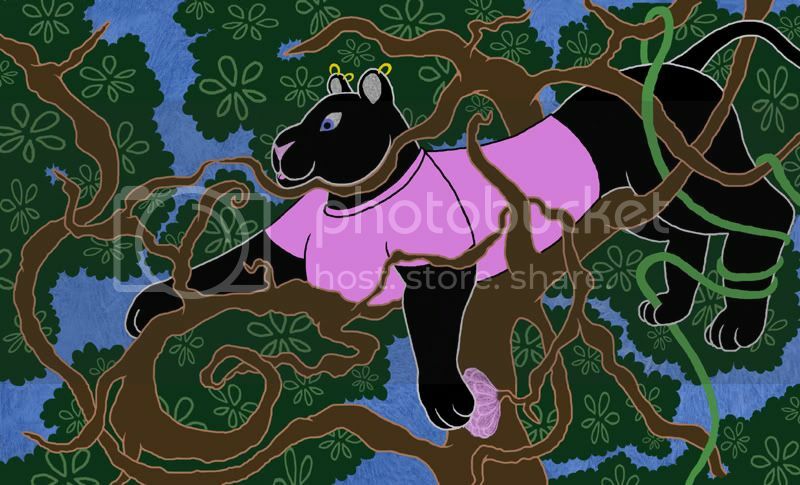 The combination of pink and black and the way both the flamingo and the panther are wearing clothes that represent each other are so cool. 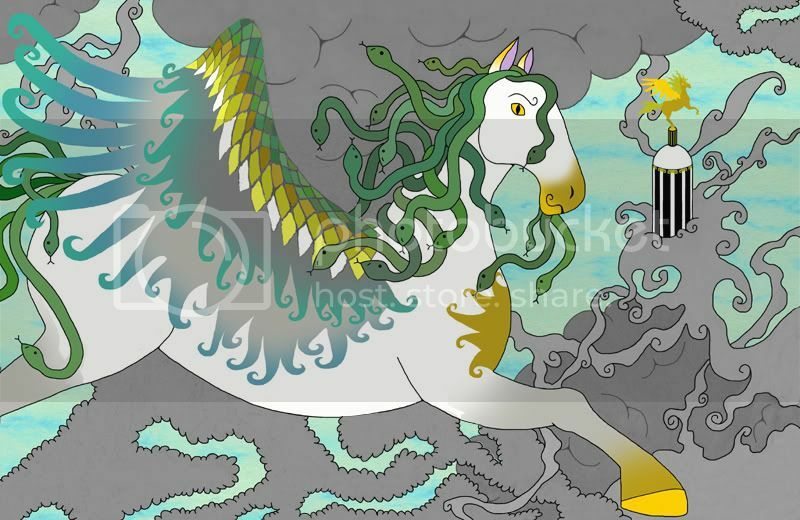 And the Pegusus/Medusa style horse is beautiful! 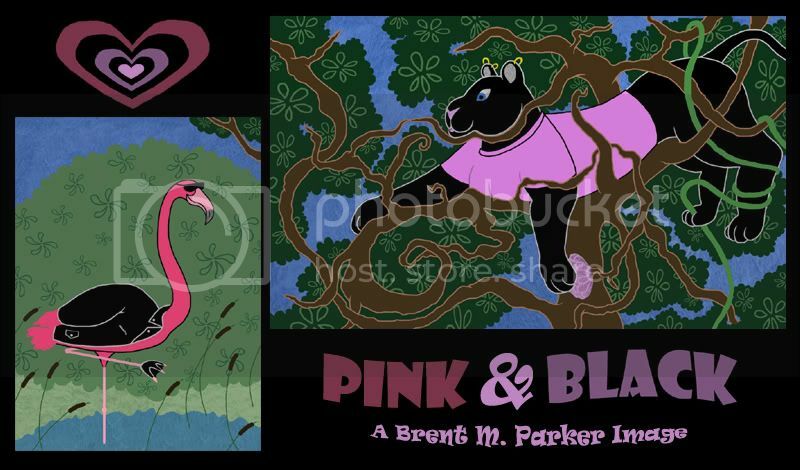 I agree- the pink and black color combo on those animals look cool. And the Pegasus/Medusa style is absolutely fantastic and creative. Here's a short little video I did in Adobe Premiere, with a picture of me that was taken at Easter. Me thinking of ideas for artwork while my characters fly/run/jump by. It's probably going to become part of a larger video project eventually. EDIT - Now with music! I spend waaay too long on my "real" artwork, but here are a couple things I did in one sitting. Here's a banner/collage thingy of various beaver characters, bookended by two versions of my own character, Remi Vitoux. 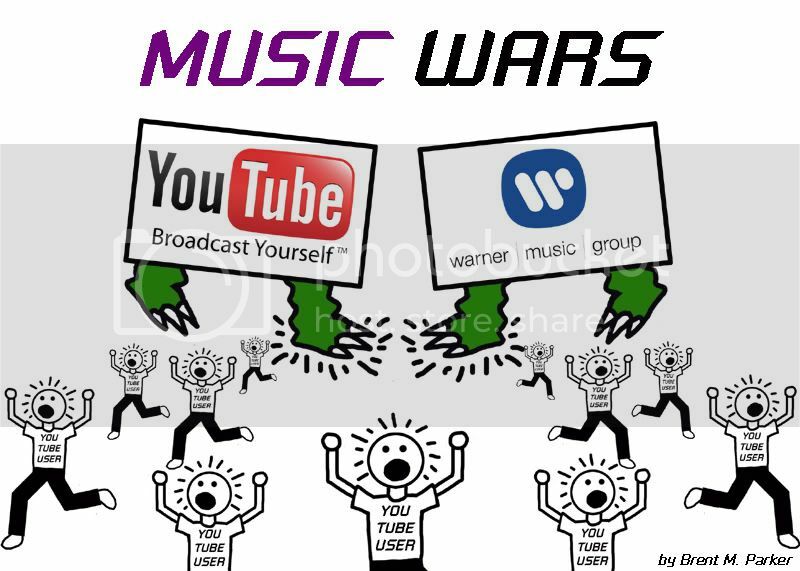 I'm writing an article on Warner Music Group (WMG) removing videos that use their music from YouTube. (One of my own videos was removed , but there's a lot to this issue). Anyway, this is just a silly image I did on the subject - the corporate giants battling it out as giant monsters, oblivious to the little YouTube users underfoot. 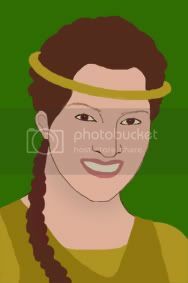 Here's a picture of my fantasy novel character Princess Prenzibeth, inspired by Kate Winslet, whom I imagine playing her in the "movie version "
"The Bizarre and Wonderful Mind of Brent M. Parker"
An original short film about my artwork, writing, and fictional universes, with moving illustration style animation, including a surreal dream sequence and a fun musical finale. Also includes an on-camera interview with yours truly. That beaver banner is cool- I didn't realise there were so many beaver characters out there! I have to say, out of all the characters featured, I like the design of your own ones the best. I've heard about the whole YouTube thing, and your representation of what's been happening is interesting. And your picture of Princess Prenzibeth (love the name, by the way!) is great as I love the whole not using outlines thing- it really makes the colours stand out. lizardgirl wrote: That beaver banner is cool- I didn't realise there were so many beaver characters out there! I have to say, out of all the characters featured, I like the design of your own ones the best. I've heard about the whole YouTube thing, and your representation of what's been happening is interesting. And your picture of Princess Prenzibeth (love the name, by the way!) is great as I love the whole not using outlines thing- it really makes the colours stand out. It's funny, I never really thought about beaver characters much until I created Remi. I never thought about there being so many, either. That "Ipana" one I just found on Google, I guess he's from an old toothpaste commercial from somewhere. The obscurest one is probably the Beaver Boys (chomping down the tree, upper left). They were in one episode of Ducktales, "Once Upon a Dime". I’m working on an original project involving superheroes and a supervillian. In the meantime, here are some more quickie text-and-screenshot banners. Can anyone name all the characters? Hint: three of them were only in one episode of their respective shows, two others were only in two episodes of their respective shows, and (as you probably already see) one of them isn’t an animated character, but a book illustration. Last edited by animagusurreal on Fri Apr 17, 2009 9:07 pm, edited 2 times in total. I absolutely love your artwork! Its so unique but amaizing beautiful! Great job! I'm working on some more "animagusurreally" pictures, but in the meantime I'm experimenting with some additional different styles. 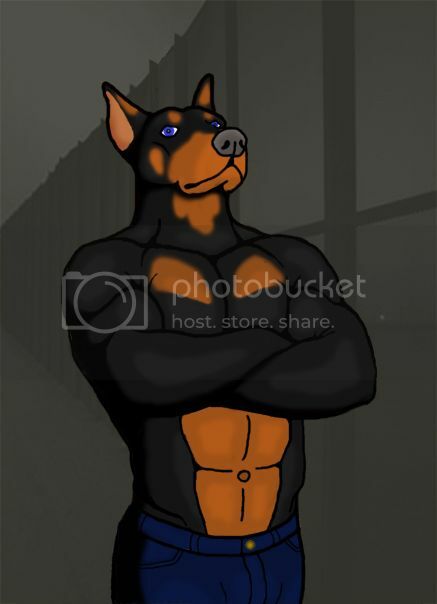 Here is an anthro doberman pincer guard at a fog-shrouded secret base. Damian Pound, a.k.a. 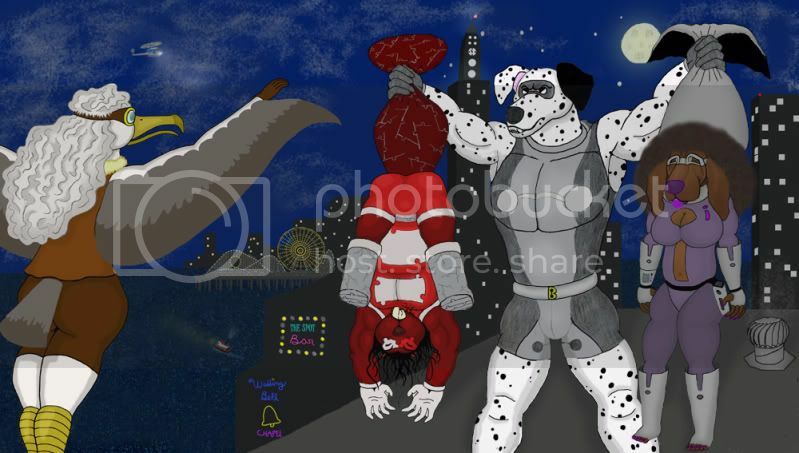 “Barbell”, a Dalmatian supervillian with super strength, holds up unconscious superheroes Remi Vitoux/“Dammage” the beaver and Iris Deck/“Identity” the bloodhound. The heroes’ albatross teammate, Isabel Cruz/“Pratfall” ponders her next move She’s a stuntwoman with imperviousness-to-injury powers. Don't worry, she'll save them, though I don't know if I'll actually get around to drawing that .